While being a girl, you go through a lot of stress to look a certain way, act a certain way and be a certain way. When you have facial hair, it is quite tricky. Meet Supatra ‘Natty’ Sasuphan from Bangkok, Thailand. Her condition causes Natty to suffer from excessive hair growth across her entire body including her face. She suffers from a genetic disease called Ambras Syndrome, also known as ‘Werewolf Syndrome’. 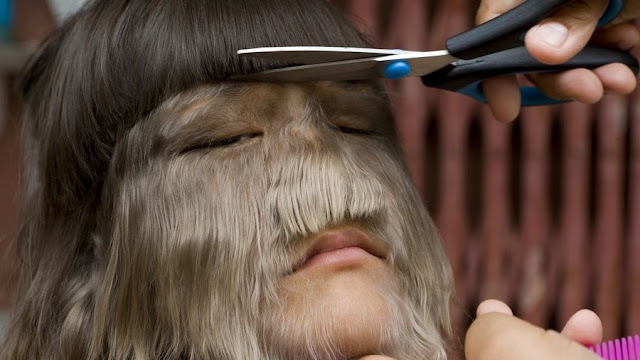 Guinness World Records have crowned her the World’s Hairiest Girl in 2010. Her parents thought that at her birth that always she’s going to go through life being bullied and having difficulty to live in society Natty was born. I mean, it’s hard not to turn your head and stare, even for a few minutes or so. Her condition is relatively rare, so doctors haven’t found a cure for it. As a form of the treatment, the laser hair removal has been tested. However, it’s unable to stop the hair from growing and lets the hair to grow back way thicker and a lot quicker.However, this has not prevented Supatra from living her life. She has embraced her condition rather than shying away from the public eye. Though she has continued severe amounts of bullying from people around the world, she remains to be an active, robust girl. When she was ten-years-old she won the record and said: “I don’t feel any different to anyone else, and I’ve got lots of friends at school…being hairy makes me special”. She continued, saying “There were a few people who used to tease me and call me monkey face but they don’t do it anymore”. The young girl’s future was under a great deal of threat. When she was born, she had to go through two operations so that she would be able to breathe. Her father noted that the family was not aware that she was suffering from a condition until she was born. But it has been nearly a decade since the little girl won the award for essentially being the hairiest person, and she’s come a pretty long way.Just like any parent would, Natty’s father’s only hope is that his daughter will one day be fully cured of her condition. In fact, she married this person and is sharing photos of her new look on Facebook. She looks happier than ever and is completely glowing. We wish her luck and only happiness. Natty is now 17-years-old and is your regular teenager. In fact, she has now begun shaving her face and body and has found the love of her life.